As writers, many of us dream of the day we’ll be able to give up our day jobs to write full time. We struggle to find time to write between, work and/or school, family, and the other obligations that fill our time. We often find (or make) excuses. How do we find the time to write when writing isn’t our full-time job? 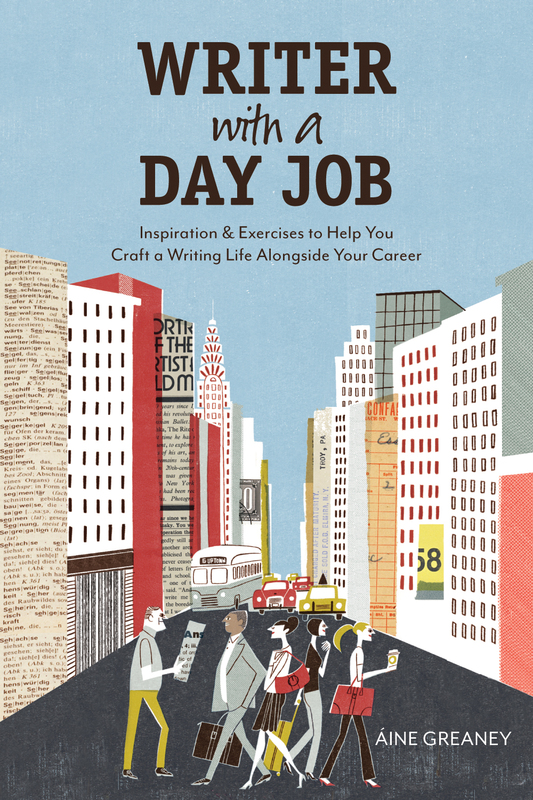 This book lists challenges (read: excuses) writers with day jobs face and ways to overcome them. It offers suggestions to find time to write during your day. For some writers, that might mean waking an up an hour early to write before the workday starts, during your lunch hour, or at the end of the day. Aine believes the two attributes which distinguish real writers from the wannabe are desire and discipline. It’s not enough to want to write, we must have the discipline to sit down and write day after day. That means we must find the time in our daily lives to grab that writing time whenever we can. Write something, anything in the time you have. Jot notes about your characters, map our your next scene. Make observations about the people/places/things around you. I love her suggestion to “visit your writing.” On the days we can’t write, she suggests mentally logging out of other tasks to simply think about our writing. The best time for me to do this is on my drive home from my day job. I can think about my next scene, about my characters or work out a plot problem in those few moments of solitude. The greatest takeaway from this book for me is that having the discipline to write regularly, doesn’t mean writing dozens of pages every day. It means making the most of our day to find time for creative expression, and to have a productive writing life no matter how busy we may be. Many of us will never be able to quit our jobs and write full time. Let’s face it, with exception of a very luck few, publishing a book will not allow you to quit your day job. But changing your attitude and the way you approach those extra few minutes of your day can make all the difference to finding balance between work and writing. Are you a writer with a day job? How do you make the time in your day to write? Check out my For Writers page to find other great books for writers and resources I have found helpful . I’ve been wanting to read this book for a while now. My best method: I try to get to work an hour early, so I can sit in the silent office and write before I actually have to start working. It works out pretty well. That’s a great way to get in writing time! I may have to try that. I work for the local public school district and as such, have my summers off. Seems ironic, but I’m much more productive with my writing when school is in session. Summer, and all that time off, drains my motivation. Somehow I get the most done when time is at a premium. Isn’t that interesting? I’ve heard others say the same thing. It seems that when time is at a premium, we are forced to structure our day to fit that writing time in. I tend to do most of my writing on the weekend, but I would say that the time I spend writing during the work week is probably more focused than when I have the whole morning free on a Sunday. ‘Visit your writing’ resonated with me, too, Jennifer. I’ve never considered that. I have one story I can’t get published but I love. It often springs to mind. I’ve even modeled some of my behavior after the main character. I am very flattered to see my book here + delighted that it has provided inspiration for your writing. Always fun to see what people take away from a book.